Lifeguard Purification Systems has the highest quality products of its kind available on the market today. Our products have withstood the rigorous tests of time with the great majority of our systems still in use even after as much as twenty years of reliable service. Lifeguard Purification Systems has adapted NASA technology to bring you the safest, healthiest, most cost effective way to purify your pool. Safe, variable low-voltage DC current is conducted into the ion chamber where electrolysis takes place. 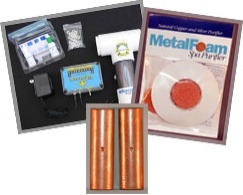 Positively charged ions of copper and silver are released. Copper is a natural toxin to algae and bacteria, and Silver to bacteria and virus. * Pure, crystal clear water without the awful odor of chlorine! * Greatly reduced chlorine use resulting in a significant savings on chemicals. * Most pools can reduce chlorine use by up to 90%. * The satisfaction of knowing that your pool or spa will be much safer for you and your family. * No more red, burning eyes! * No more dry, irritated, and itchy skin. * No more dry, damaged hair or bleached-out clothing. * Relief for those with allergies or sensitivities to chemicals. * Less damage to your pool. Chlorine is a corrosive chemical that contributes heavily to the deterioration of pool liners, pipes and equipment. * Backed by one of the best warranties in the business! * Give our product a try today.